* I have 10 million pairs of work out pants but these are more than 50% off. How can I not buy them? * Just yesterday I was saying I need to replace a few of my work out tanks. Why not do that now? * I can wear this in my everyday life not just working out so totally worth it. Next thing I know my “cart” is full of lovely lovely lovely items and my pocketbook (electronic of course) is feeling the pain. Here is the thing. I like to be comfy. It’s kind of a new thing for me. Earlier in my life (like a year ago … ) I would refuse to go out in my “work out” gear. I’d rather die then go meet friends for lunch in anything but a dress or fancy jeans. AND shoes … tennis shoes were for working out and that was it! Going out required heels, fancy sandals, or fashionable boots. Tennis shoes were not a part of my regular wardrobe. In fact a few years ago (maybe a few more than a few) I made a trek out to what was, at that point, a new place for me – Lucy’s. I had discovered that their work out pants were far superior to my generic Target brand and worth the extra cash. While at the store I couldn’t help but notice that they were selling the brand as a lifestyle. One for young moms who felt the need to be sporty while still being semi stylish. I laughed out loud (and may have pointed in my mocking way) at a t-shirt that said “Got Kid?”. Who would wear that stupidity? Me. Now. Well maybe not the “Got Kid?” shirt since that is really kinda dumb and I don’t have kids so would be misleading and somewhat creepy. BUT I do own a number of Lucy t-shirts, tanks, and long sleeve ts. Most with some design that someone thought was “sporty yet stylish” in that “young mom” way. AND I LOVE THEM. I LOVE THEM ALL. You are hard pressed to find me outside of work in ANYTHING but work out pants, t or tank, and tennis shoes. I LOVE BEING COMFY … IT FREAKIN’ ROCKS. Now here is the kicker. I’ve never been able to stomach breaking down and wearing the Wendy Uniform to work. Even on casual Friday’s I pull out the fancy jeans and high heal sandals. It won’t last. I’m telling you that right now. 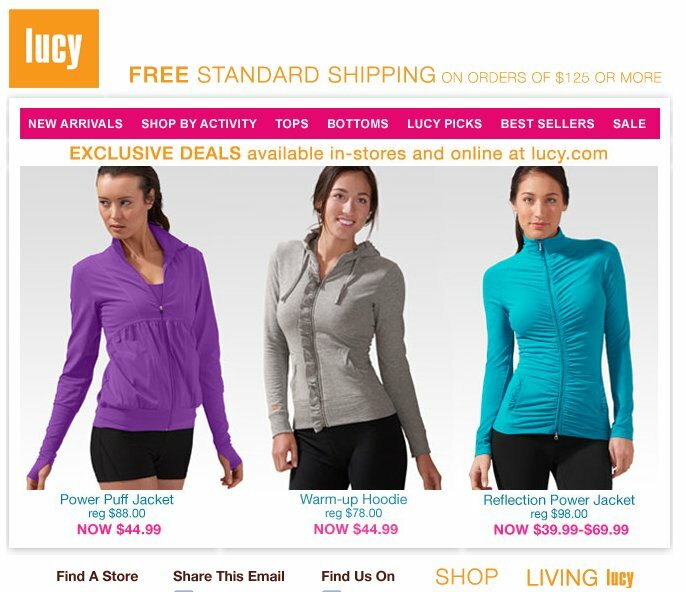 One of my co-workers/friends, who introduced me to Lululemon, informed me she wears Lululemon gear to work all the time. Even going as far as wearing the pants instead of work slacks. SHUT IT! HOW EXCITING IS THAT? AND she is super fashion chick. Since she has said that I’ve noticed the little Lululemon ohm sign thing on some of her work outfits and think, “BY GOD SHE IS DOING IT. SHE IS LIVING MY DREAM.” Today I noticed our receptionist had a fashionable pair of pants on … WITH THE LULULEMON OHM SIGN THING ON IT. So you see. It’s only a matter of time before the Wendy Uniform really is all I wear!